Om ! Speech is rooted in my thought (mind) and my thought is rooted in my speech. Be manifest, patent, to me; be ye two, for me, the lynch-pins of the Veda. Let not Vedic lore desert me. With this mastered lore, I join day with night. I shall speak what is right; I shall speak what is true. Let that protect me; let that protect the speaker. Let that protect me. Let that protect the speaker, protect the speaker ! 1. 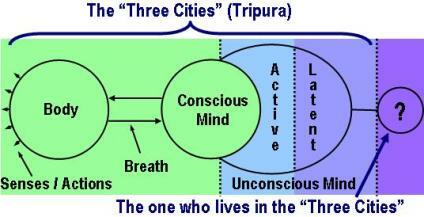 Three cities [tripura] are there, and pathways three for all. (On the dais of Fortune) are letters a, ka, tha and others. The exceeding grandeur of the gods. Gentle healing deities nine and gestures nine. As fond mother’s love, encircle me. Adorn indeed (the knowers of Brahman). With triple constituents (She is the prop). This group of three among the sheaths is prime. The God of Love with Fortune’s Goddess dwells. The Eloquent – (These on Consciousness do wait). And enter the supreme Triple City. Mother of the vast universe. (Seekers) achieve the state of Immortality. With sixteen (She sustains the core of their abode). The man of desires gains that which he wants. Merit and success for himself achieves. Attachment’s path; and swiftly smites with bow and arrows five. Grant gifts to the fortunate here. Removes the aspirant’s twofold sheath. Nay, one with Cosmic Being. And other forms of knowledge laud. Om, Hrim, Om, Hrim – thus ends the secret doctrine. Here ends the Tripura Upanishad, included in the Rig-Veda.